– 1 Gb (128MB) SDRAM DDR2 memory. – FPC for RGB LCD display, and an SD/microSD card slot. 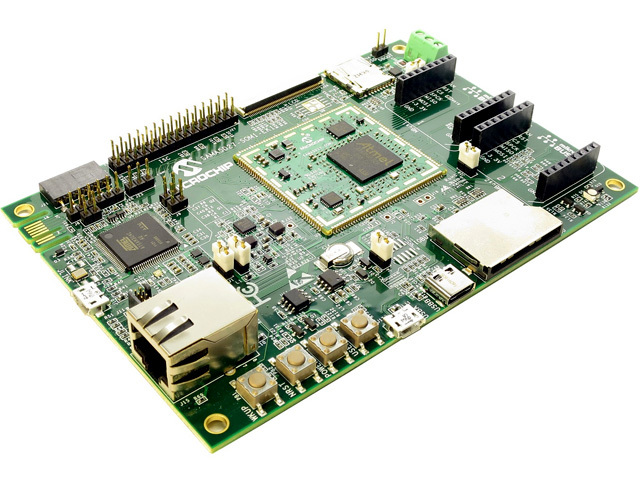 The ATSAMA5D27-SOM1 (System on Module) kit is designed for easy integration in customers' applications. It is a single sided PCB with soldering areas along its edges that facilitate installation (even manual soldering is possible) – this simplifies the PCB structure and as a result lowers its manufacturing costs. Additionally, the manufacturer provides users with a Linux distribution and an appropriate software set to help them quickly start developing their own projects.